Hope everyone had a great Thanksgiving & had a fun filled shopping weekend. Our favorite Holiday is approaching & we are looking forward to it. Thanksgiving is a time when we can reflect on all the great people around us; our family, friends & great fans. We want to Thank all of all you out there that continue to come out & support us, regardless of the weather conditions and where we are. We did not mean to go stealth on everyone over the last few days, we have tried to respond to a few emails but they have been overwhelming. Our primary concern is for Mohamed's (Moody) health. We have been keeping him up to speed on all the support we have been recieving via twitter, email & voice mails. He asked that we tweet out to everyone his appreciation and that he can't wait to see everyone again...he really misses the truck, we all miss the truck but we are all happy that we have each other's company...we are all happy that we can talk to each other....we are just happy it was not a lot worse. Fellow Food Truckers such as Schnitzel & Things, Mexicue, Rickshaw & others have offered to donate a percentage of today's sales to help rebuild Frites'N'Meats. Our fans, Food Truckers in LA & some folks we never even meant have offered to help and want us back on the road. This is why NYC is really the best place in the world...in the time of need everyone wants to help, so much so that you don't even know how to accept all that help. A close friend of ours opened up a paypal account to accept donations and set up an email account for inquiries on the rebuilding efforts, it is fritesnmeatsdonations@yahoo.com We believe this is the best way to accept support from everyone, as it allows for transparency & accountability. We cannot just accept funds from people & not have it accounted for. We will have a third party account for all the funds received and confirm they are used to rebuild Frites'N'Meats. In the event funds are left over, we would donate them to local charities & schools we have donated to in the past. We will provide additional detail as time passes by & we can't wait to see you all again. Thank you everyone for all the love & support. I take it everyone heard what happened today...we are at a loss for words. The accident that occurred could have been so much worse...yes the truck is destroyed but everyone is ok. Mohamed, aka Moody will be in the hospital for a while but he will be OK; everyone else is fine. I want thank that individual who answered my tweet this afternoon and provided detail of my brother's whereabouts when I had no idea what was happening...I can't recall his name as everything was a blur for a while but if you are reading this - I owe you one! We want to Thank Everyone for their warm wishes & prayers...We want to Thank all our fans, twitter & most of all, The FDNY, NYPD and the Emergency responders that came to the scene - THANK YOU ALL! God Bless all the responders at the scene - Thank You! We had a great time at the Touch-A-Truck event...we are sure everyone enjoyed it as much as us and our Mascot did as he made a surprise appearance for the kids :)...it was a blast!!! This week's Burger of The Week will be The SPICY JAZZ - Seasoned Grassfed Angus Patty with roasted red bell peppers & jalapenos and cheddar cheese & jazzy sauce. The Maker's Mark Kobe Burgers will make its first appearance in Midtown East this Tuesday - hope you guys are ready for it! Don't forget to log on to our site, fritesnmeats.com, via your smartphone as it is now powered by MobileMeteor! From there, a map will appear with our current location. You can also clearly view our blog for schedule and menu and rate your experience with us! We look forward to hearing what you think. False alarm on the weather last week....thought it was spring...a few more weeks I guess. We are sticking with the salads though (maybe they will make the sun come out). Our House Salad & Spring Salad will be available again this week. A few weeks ago, a couple of our avid twitter followers (you know who you are) recommended ingredients for a new Burger Of The Week; we took it under consideration & the following BOTW was born....The Neapolitan - Seasoned Grassfed Angus Patty, Sauteed Mushrooms, Mozarella & Homemade Pesto Sauce - we know it's gonna be Delish!!! The Maker's Mark continues to flow from KY. The Maker's Mark Kobe Burgers will be available again this week in SoHo :). We are also getting ready for a really cool event... Touch-A-Truck; please check it out. It is being held this Saturday, April 9th, 11 am-2 pm, 18th Street between 6th & 7th Avenues in Park Slope, Brooklyn. All proceeds benefit the Arts Programs at P.S. 295. We feel it...spring is in the air...well it better be, because we are packing up the soup hardware & busting out the Salad goodies :). So be sure to check out our House Salad & our Spring Salad - it's good stuff, you'll like it. Not only that...but the fine folks in Kentucky sent us over a case of Maker's Mark...geee, I wonder what to do with that? 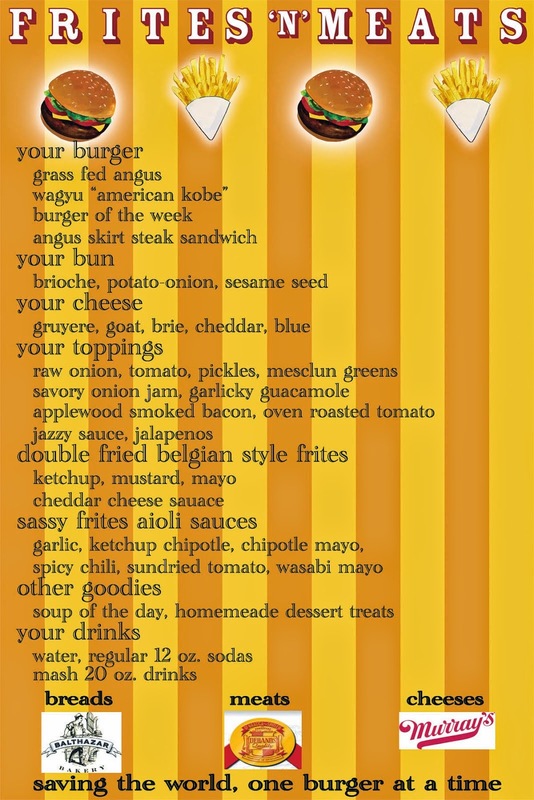 Yes folks, the Maker's Mark Kobe Burgers will make a once a week appearance; this week, it will be at SOHO. The Burger Of The Week is The Italian Job...Seasoned Grassfed Angus Patty, Mozarella, Gorgonzola & Parmesan Spread, Applewood-smoked Thick-cut Bacon & Salsa Verde. We are also getting ready for a really cool event on Saturday, April 9th...Touch-A-Truck; please check it out. All proceeds benefit the Arts Programs at P.S. 295. Did they say spring is here? The Burger Of The Week is the MARITAL BLISS - Seasoned Grassfed Angus Patty with Philadelphia Cream Cheese, Jalapeno Peppers and Applewood-smoked Double Thick Bacon. On Saint Patrick's Day, we brought back the THE BOURBON BURGER - Marinated Kobe Patty and marinated onion jam and oven roasted tomatoes! Once again, the people loved it. So.....we will bring it back for another day. It will be available this Friday :). Have a great week everyone & lets do the Spring Dance! This week's Burger Of The Week is THE WILD THANG - Seasoned Grassfed Angus Patty with Wild Ketchup Chipotle, Double Battered Onion Rings, Cheddar Cheese and Applewood Smoked Bacon. On Saint Patrick's Day, we will have a special treat for you....some of you might remember this from an event we had a while back...you ready...THE BOURBON BURGER - Marinated Kobe Patty and marinated onion jam and oven roasted tomatoes! Yes - marinated with Bourbon of course. Have a great week all and a safe Saint Patrick's Day! Given last week's exceptional feedback to the The Kamikaze, it looks like we have a new addition to the BOTW line up! This Week's Burger Of The Week - BYMARK - Seasoned Grassfed Angus Patty with Brie, sliced grilled mushrooms, Garlicky Lemon Aioli on a Brioche Bun. The Kamikaze...Seasoned Grassfed Angus Patty, Double Battered Onion Rings, Provolone Cheese, Honey Wasabi Sauce & Applewood-smoked Thick-cut Bacon. WOW! - Tell me that's not gonna be a good one. But wait there's more (no, we're not gonna give you ten for one ;)....you can now wash it down with a nice COLD BEER*! *Beer is non-alcohol Beer though....we don't want you tripping back to the office. Hope everyone enjoyed their three-day weekend. We are adding a new addition to the Burger Of The Week line-up, hope you like it. It is the - The Grand. Seasoned Grassfed Angus Patty, Marinated Sliced Roast Beef, Oven Roasted Tomato, Mozzarella Cheese & Homemade Gravy Cream. HAPPY VALENTINES DAY EVERYONE!! Much LOVE to all our fans out there! We'll make it quick...the Super Bowl is about to start, YEAH!!!! Enjoy The Game and have a great week everyone!